Gerald Jermaine Wallace was born on 23rd July 1982, in Sylacauga, Alabama USA, and is a professional basketball player, who has played for such teams as the Sacramento Kings, Charlotte Bobcats (Hornets), Portland Trailblazers, New Jersey (Brooklyn) Nets and Boston Celtics of the National Basketball Association (NBA). Although he is currently without engagement, he hasn’t yet announced his retirement. His career has been active since 2001. 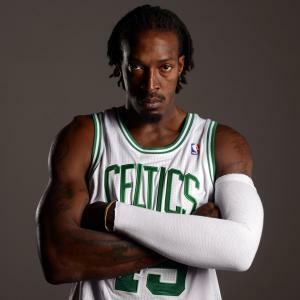 Have you ever wondered how rich Gerald Wallace is, as of early 2017? According to authoritative sources, it has been estimated that Gerald’s net worth is as high as $28 million, earned through his successful career as a basketball player. Although born in Sylacauga, Gerald went to school to nearby Childersburg High School, where he was introduced to competitive basketball, and was quite successful; in his senior year, Gerald received Naismith Prep Player of the Year honors. Following high school matriculation, Gerald enrolled at the University of Alabama, where he continued his basketball career, however, he spent only one year at college, averaging 9.8 points and 6.0 rebounds, before he declared for the 2001 NBA Draft. His professional career officially began when he was selected as the 25th pick overall by the Sacramento Kings, where he played alongside Peja Stojakovic, Chris Webber, Vlade Divac, all of whom were all-stars, and surely helped him become a better player. In three years he wore the Kings uniform on 135 occasions, however, his numbers were extremely low. In 2004 he was unprotected by the Kings in the Expansion Draft, and was selected by the Charlotte Bobcats. There his career flourished; in his first season he played in 70 games, starting 68 of them, and averaged 11.1 points, 1.3 blocks, and 5.5 rebounds per game. Little by little his stats numbers improved, and in the 2005-2006 season he had 2.5 steals per game which earned him NBA steals leader award, and added 15.2 points and 7.5 rebounds per game. He continued to improve offensively, and reached 19.4 points per game, his career high, and improved his net worth. He played for the Bobcats until 2010-2011 season, and in 2009-2010 averaged a double double with 10.0 rebounds and 18.2 points. He was then traded to the Portland Trailblazers in the middle of the 2010-2011 season for Dante Cunningham, Sean Marks, and Joe Przybilla, and two draft picks. Until the end of the season he helped Blazers reach playoffs with 13.3 points and 6.6 rebounds, but they lost in the first round to the Dallas Mavericks. After Portland he became a New Jersey Net, but in his first season played in only 16 games, as he injured his leg, averaging 15.2 points and 6.8 rebounds. After the season ended, Gerald’s contract expired, but he had re-signed with the Nets, who moved to Brooklyn; his contract was worth $40 million over four years, which certainly increased his net worth by a large margin. Unfortunately, his next season was ravaged by injuries, and in the 68 games he played, Gerald averaged only 7.7 points and 4.6 rebounds. As a result he was traded to the Boston Celtics, a trade that sent Kevin Garnett, Paul Pierce and Jason Terry to the Brooklyn Nets. His troubles didn’t cease, as he played only in 16 games for the Celtics in two years, before he was traded to the Golden State Warriors. He was then sent to the Philadelphia 76ers just a few days later, but on 27th September 2015 he was waived by the 76ers. He is still without engagement, but hasn’t yet announced his retirement. Regarding his personal life, Gerald is married to his childhood sweetheart Warneisha, with whom he has a daughter. Gerald also has three children from previous relationships. Gerald is also a well-known philanthropist; he started the Gerald Wallace Foundation, which focuses on improving life to underprivileged children and families. 1 Came in second place at 2001/2002 NBA Slam Dunk contest.